This is the Continental pattern, Simplicity 2059, which includes a dress, blouse, and skirt. I want to show you the dress first. I like this style because it’s very easy and comfortable but can also be dressed up. 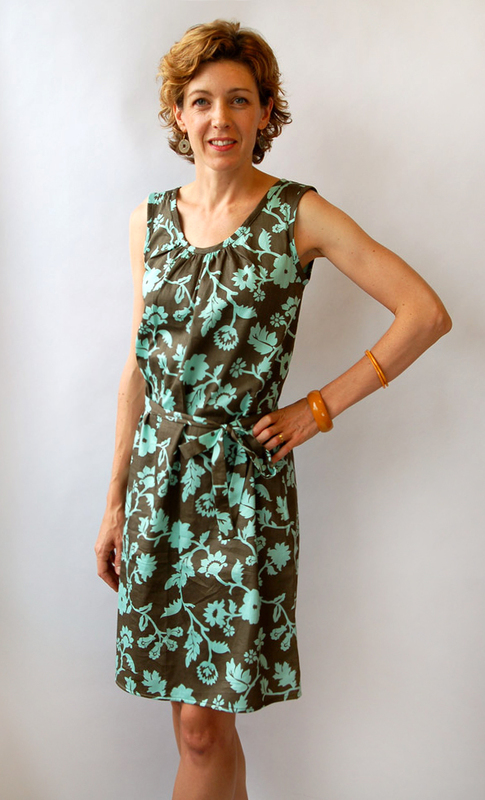 I made this dress in the floral sateen from the fall Lisette fabric collection and wore it with the self belt. And here it is again, made up in handkerchief linen and worn with a leather belt. I also like this pattern because it can be layered when the weather turns cool. I wore this style all last winter, layered over turtlenecks, tights, and tall boots. It look great worn with jeans, too, so it’s very versatile. The blouse and skirt patterns in this package are also very simple, straightforward styles that are quick to sew and easy to wear. Here they are also made from this season’s Lisette fabrics, the blouse from our delicate floral lawn and the skirt made from my favorite of all our fabrics, the lightweight canvas in an ikat print. The blouse is such a relaxed, fun style that’s very simple and minimalist from the front, with the surprise of the cute gathered detail in the back. And the bias-cut, A-line skirt is flattering on nearly everyone. I love the asymmetrical seam where the two sides join for a mitered stripe effect. I hope these photos provide you some inspiration and that you’ll share what you make from this pattern in the Lisette Flickr group. Lovely,I really,really like the blouse! Oh, lovely. Thanks for these. It’s great to see the dress worn as I really like the look of it on the pattern envelope but there is no modelled picture…. I so wish Joann shipped overseas, I love the fabrics of the Fall line even more than the summer line – especially the Ikat stripe – and the other dotty stripe one too,…. I am extremely curvy for my height but think these will be quite flattering. I will fit the top slightly around the bust and bias skirts are great for comfort when one has a wee bit of a tummy! Have you made any alterations in the dress/ blouse width at all? I just bought five of your patterns today, got out the continental and freaked out a little when when I saw the finished measurements for a 30.5 inch bust would be 37 and 38 inches for the blouse and dress respectively. I’m afraid I’ll be swimming in it. If that is the case, any suggestions on how to narrow down the fit? Thanks for your response Todd, I did have a look at the blog before buying the patterns (including the post you’ve linked above), however, the fit of the continental dress and top shown in the pictures above does not look like standard Simplicity sizing i.e. 37 and 38 inches in the garment bust for a 30.5 inch-bust wearer. I merely wanted to know what modifications were used to achieve the fit shown in the pictures above. I have also also looked at pattern reviews (on the pattern review site as well as on various blogs) and every review (bar one) for the 6-14 size pattern in the Continental states that there is excess ease in the top and dress (even with going one size down as suggested in the blog post you linked to). I’m sure the writers as well as the readers of those reviews would greatly appreciate it if you explained how you managed to get them to fit so well. TJ, I made no adjustments to the pattern. I measure a 34″ bust with a B cup, and I made a size 10, which is what I usually make for the Lisette (and all Simplicity) patterns. Sometimes ease can be deceiving. In this case, it allows for a comfortable fit without a sloppy appearance. This will be somewhat dependent on the fabric you choose, of course. I used lightweight fabrics or fabrics with a little drape: Lisette sateen for the blouse, and Lisette lawn and a handkerchief linen for the dress. I wouldn’t suggest using a quilting cotton or anything too stiff for either of these styles, but I think you’ll be pleasantly surprised at how the ease really doesn’t overwhelm the style. I should also have mentioned that the extra ease allows you to get the dress/top over your head without a closure! Thanks guys, I’ll try it in a cotton voile and post the results when I finish.